“I’ll Have Another” is clearly the favorite to win the Belmont Stakes, no question about it. However, there are a few areas of concern that is not in the news every day. 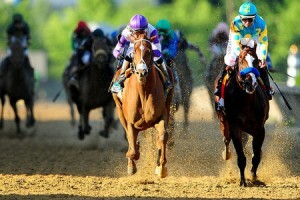 For one, blogcritics.org reported that “on Thursday, May 31, 2012, a runaway horse could have caused all the Triple Crown dreams to fade away. As I’ll Have Another horse came very close to crashing into it.” This could have meant the end of an opportunity for the chestnut colt to make history. Luckily, I’ll Have Another’s foot was merely lightly grazed and was able to continue the workout. Today, the New York Times is reporting on the checkered history of I’ll Have Another’s trainer, Doug O’Neill, and their report is quite disturbing. In their editorial, “What’s at Stake in the Belmont,” the Times points out that Doug O’Neill “has a long history of racing sanctions and penalties for administering illegal and dangerous performance-enhancing concoctions. Nothing could be worse than to see I’ll Have Another win the Triple Crown and then have his victory erased as a result of O’Neill’s rule-breaking practices. It is also noteworthy to point out that as recent as last month, O’Neill received a 45-day suspension by the California Racing Association for using enhancers to improve the performance of another horse in his inventory. With the tension that will accompany next Saturday’s Belmont Stakes, gamblers need to be aware that there are factors other than a horse’s ability that could keep it from performing as expected. I’m open to hear your thoughts. 2 Responses to "Belmont Stakes 2012: “I’ll Have Another” Will Win Triple Crown if trainer Doug O’Neill quits"
I do accept as true with all of the concepts you’ve presented to your post. They are very convincing and can definitely work. Nonetheless, the posts are very quick for beginners. May just you please extend them a bit from subsequent time? Thanks for the post.